Really nice truffle oil for me and my other friends as a gift . Really nice truffle oil! Nice fragrance and taste, I loved cooking with this product. I was so sad when we used it all and definitely foresee myself buying more in the future. I have been searching for a new supplier truffle oil since the company I previously used was not good.My wait is over! Profine Food Stores truffle oil is delicious, fragrant and reasonably priced for their quality. I started with the 50ml bottles to test; I've since graduated to the more bottles. The items come packaged well to protect the contents. These oils are awesome, especially cooked with scrambled eggbeaters. It's very flavorful. A little goes a long way. Once I run low, I'm definitely buying again. A delight for your taste buds and nose - wonderful flavor and scent! Excellent truffle oil and all salts as well - truly delicious, although a little goes a long way, so use sparingly. I have bought this brand several times for my own home cooking and also as a gift. The wonderful aroma and taste is such that I use it on many dishes to boost their flavor. Highly recommend. I am a big fan of truffle, I can mix with everything. This is a great truffle oil, the smell is amazing the the flavor too. This was a chance I took as they say 'you get what you pay for', well I am glad I took the chance on this purchase. The price was right, but the flavor of these truffle oils was priceless. 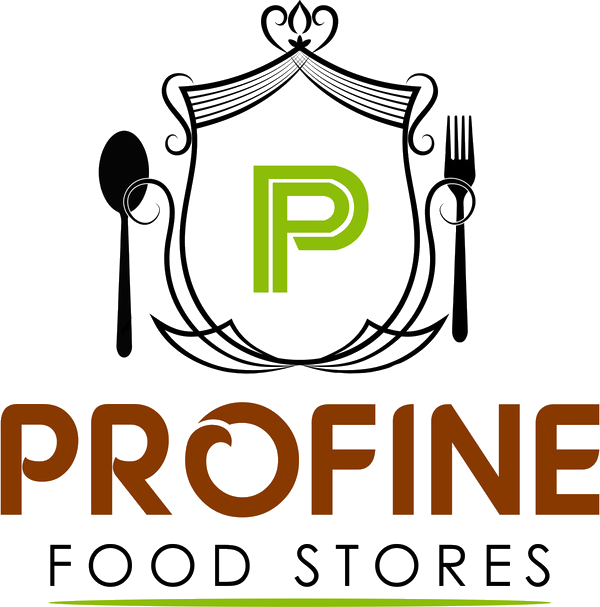 I will be making more purchases from Profine Food Stores and I will recommend to all my friends. Well done team. I feel I was at a great restaurant, where I had truffle oil potato chips. So this was well packaged and received on time, but that's not the thing about this product. I was at a great restaurant, where I had truffle oil potato chips. And I thought I will never have these again. And I got home and found a recipe, but I needed truffle oil. Profine Food Stores had a good price, so I thought I'd try it. Last night my recipe turned out perfect, so I love this product. A Glimpse Into the Secret World of Truffles . Until you taste them, you won't understand, and when you do, you might become addicted. At the first taste, you don’t get what all the fuss is about. The first contact of the truffle oil with the tongue doesn’t leave much of an impression. But then, within moments, the taste buds are activated . Pungent, lovely, earthly. A little goes a long ways! I love truffles! I have been buying truffle oil from Profine Food Stores . I thought it was amazing for a tiny little bottle for about $20 I had no idea when I purchased it ! I truly wish I could bathe in it. When I opened the bottle right away I could smell that wonderful buttery intense goodness,the smell matched the taste. Intense buttery, earthy golden umami. So delicious. Forget buying your truffle oil from the grocery store! Buy your truffle oil from Profine Food Stores. This truffle oil is the way to go! Thank you! I have used a couple of others that cost twice as much and tasted them side by side and I personally can not taste the difference. That being said they are all wonderful. No bitter taste. Not rancid. Just fantastic truffle oil here. This is very good and priced great! I will be ordering again as soon as these bottles are empty and that won't be long! A little drizzeled over meat or veggies. Wonderful mixed with your favorite Balsamic Vinegar on a salad! You really don't want to use too much of this. If you do, you will be like us and just keep it in the fridge for nearly an entire year. Once we tried it again (just a drop in melted butter spread over popcorn), we fell in LOVE! Now I put just a drop on pastas almost every time! It has become a necessity. If you haven't tried it, you haven't lived! I have been testing different brands since I had some shipped from Italy. This brand is just THE BEST TRUFFLE OIL EVER . After trying a small bottle bottle,I ordered second one. Danger- it is addictive! Love, Love, Love this Truffle Oil Love, Love this product best quality ever. I use two to three bottles per month on our Truffle fries and people can not get enough of them. Great product, fast shipping and great company. Thanks…. 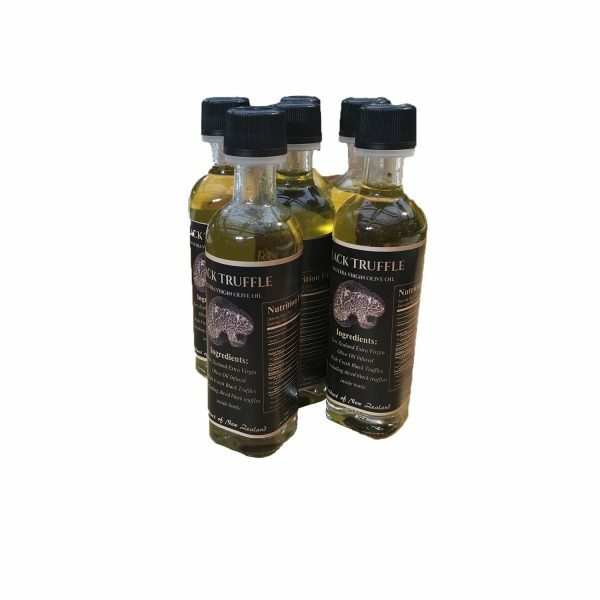 This Truffle Oil is wonderful as it changes the taste of many foods and love getting compliments on my cooking. It doesn't take much oil either so this set will last me --maybe 6 months-depending on how much I cook. It is not easy to describe the flavour and aroma of the black truffle oil and salts . It is appealing and earthy. You can create the sexiest dish with this simple trick of adding several drops of truffle oil on any foods. I've only used truffle oil tonight, it is STRONG and aromatic...in a good way! If you're just using a few drops, you can add a great flavor to your dish as a finish. When I have something, like caprese or pasta with olive oil, I just add a little of the truffle oil to the mix. Definitely don't plan to use JUST the truffle oil for an olive oil dish: that would be the definition of too much of a good thing I've tried other truffle oils and truffle salts due to my obsession with truffles. The salt is probably my favorite, but there are just a lot of dishes out there that need truffle but don't need salt added, so I've decided to keep both in my kitchen. This was a gift and I have not tried it. BUT when I received it I opened it to make sure no damage had happened in shipping. OHHHHH just opening the sealed box released a delicious truffle aroma. I am positive this is a quality product for the gourmet cook! I will be buying this set for myself! Subtle embellishment to even simple dishes like french fries. Great with eggs. We love truffles and this product is wonderful for cooking. This is wonderful smelling oil. I used it in a mac n cheese recipe. I have also drizzled it over turkey meatballs. Might add a little to my turkey stuffing this year. It is SUPER-concentrated, so will be sharing with friends. I'm excited to make my own truffle aioli! I can't wait to make some and put it on my sandwiches and burgers. I'll even dip my fries in it. Yum and thank you! Decent taste for Risotto, Pizza, Salad and an Omelette.... That's all i've tried it on so far. Best Truffle oil out there. I got turned on to this by a chef when I went to a cooking class. I tried it at home and was blown away! Whenever I cook with mushrooms, I use just a small amount-you don't need a lot. It totally enhances the flavor of the dish without being overpowering. I was buying the small size and then decided that get more bottles and truffle salt were the best deal for me. You won't be sorry you bought this! Just got back from Italy and still craving the taste … Just got back from Italy and still craving the taste of Black truffles. I have already used this white truffle oil in two dishes and the flavor is sublime. This is the only truffle oil we've found that is reliably strong and pure enough for our house popcorn. Takes less to make the corn flavorful. It's efficient. 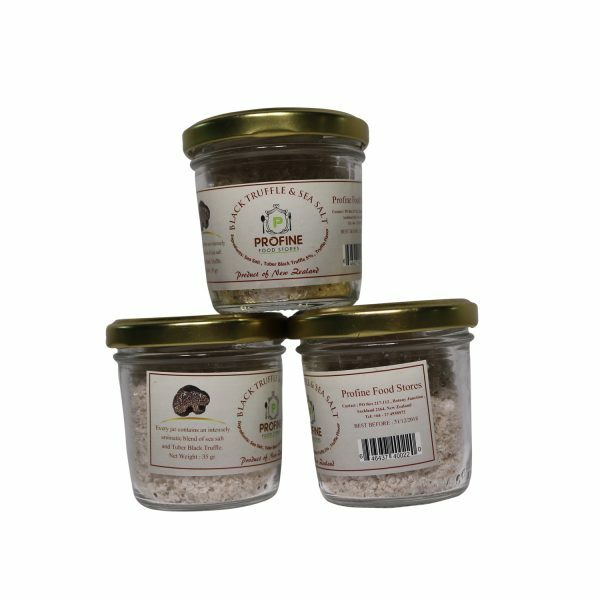 All of Profine Food Stores truffle products are highly recommended! Amazing truffle oil, especially for the price. I used this for an Israeli CousCous with wild mushroom recipe, and it was perfect. The flavor was exactly as it should be, and this bottle lasts forever since you really shouldn't use much truffle oil for anything: I never use more than a teaspoon or two for a dish that serves multiple people. Anyways, if you know what you're doing, this will last a very long time, and for the price, that's pretty fantastic. Easily turn your simple dish to extraordinary dish ! Just add truffle oil drops on it and invite your matte. I have purchased this oil and salts several times. An incredible quality truffle oil and truffle salts for the price. Use it for everything! Especially awesome with popcorn and veggies. GREAT product/great price !! A MUST BUY... I am a novice concerning cooking but it is my great joy. I love making unique dishes with amazing flavor. Silent munching around my table is the "happy place". This product will help achieve that with pasta/soups/risotto/rice... if you would add mushrooms...you can use this. SO inexpensive and flavorful...fantastic base oil that is light and doesn't take from that wonderful truffle taste. The (2) bottles I have purchased had 3 shaves of black truffle dancing around in the bottle. Wonderful flavor, reasaonably priced. I needed just an oz. or so for a truffle butter roast chicken. This was just the ticket. Good, strong flavor, which held up well. I've since tried it in buttered potatoes and a white sause. Quiche is next! I'm sold on this! A Winner! Winner! Aust made Tofu Scramble and added a dash of this Truffle Oil. Such a delicate aroma, and what a savory flavor added to the dish. Perfect! Used this just last night --- after doing some Korean beef satay kabobs in my 12" Lodge cast iron skillet, threw in about a 1/3 of a stick of butter and a half pound of sliced white mushrooms (and maybe a 1/4 cup of an already opened Napa Cabernet) ... let it all reduce, and at the last minute drizzled some of the black truffle oil over it ... damn; i'm getting hungry all over again. suffice it to say, this oil is awesome; highly recommend it.